I confess having walked out of “The Miracle at St. Anna” after 40mins at TIFF. It's an accepted practice at festivals, since you’re watching a movie (especially one with a 2hr 40mins running time) there are usually two or three other films you could be watching instead. With “Miracle” there were a lot of walk-outs, but I still felt bad to give up on Spike Lee, one of my favourite directors. But now with its DVD/Blu-Ray release I can give it another chance and see if the other two-hours were better than the first 40mins. Unfortunately no, it’s consistently confusing and headscratching. It’s important to know the plot in order to understand how so very wrong this film goes, so bare with me: The film opens in the present (actually the mid 80’s). A black, elderly retail postal officer is conducting his everyday business of selling stamps. One of his customers looks familiar, an Italian man of similar age. The postal worker pulls out a luger and shoots the man in the chest killing him. A young ambitious newspaper reporter played by Joseph Gordon-Levitt investigates the case. Found in the man’s home is a long lost head of a statue taken from a bridge in Italy in 1944. Meanwhile somewhere in Italy we see the reaction of two men to the news report of the found statue – one of whom is played by John Leguizamo. 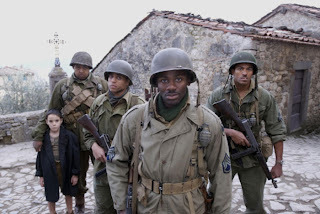 Then the film flashes back to 1944 Italy as the famous African-American Regiment, the Buffalo Soldiers, are making their way across the countryside. After an attack only a foursome survive. A large but gentle youngster Private Train (Omar Benson Miller) discovers an orphaned Italian boy and takes him along the journey to safety. While hiding out in an Italian village they encounter an Italian resistance group one of whom may be a German spy. With the Germans on their heals they have to negotiate their way back to the safety of their Regiment. The carefully directed opening flash-forward teases us with a dual-story of present and past. Joseph Gordon-Levitt is given much screen time and attention as the do-good reporter trying to break his first story. John Leguizamo and John Turturro appear briefly as well. Oddly we never seen Leguizamo again, nor Turturro and Levitt only briefly at the end for an ineffectual warp-up. The murder investigation is completely discarded for a non-sensical reunion on a beach in the Caribbean. Clearly running time wasn’t a factor in this massive structural omission as the film still ran 2:40mins. It would appear everyone just gave up and stopped filming. Added to these problems is Lee's ham-fisted and extremely blunt characterization of the relationship of the black soldiers to the white soldiers. The dialogue and direction of the white characters are so poor I can only think it as a means to advance Lee's political agenda. The only saving grace is a well choreographed battle scene in the village – a particularly brutal scene which Lee directs without any heroic artifice. When characters get shot, it’s truly shocking and painful. Recalling last year's heated quid-pro-quo between Spike Lee and Clint Eastwood over the absence of black characters in Eastwood's Iwo Jima films, if we're judging on the battle of the quality, integrity and reach of the films the winner is now clear.